Crosley Keepsake review | What Hi-Fi? We’ve seen it time and time again in films; a character opens a stolen suitcase and instead of the small fortune they expect to be inside they’re faced with rocks or blank paper. The ensuing disappointment somewhat mirrors our own upon encountering the suitcase-style Crosley Keepsake turntable. Perhaps our revelation shouldn’t have come as a surprise after our experience with the two-star Crosley Cruiser (£80). Its performance left much to be desired, and due to its cartridge’s unusually heavy tracking weight (over 7g when around 2g is more typical), we felt it might eventually ruin your record collection. Its big brother, the Keepsake, is guilty of the same crimes, which is a pity considering it gets thumbs up for both its design and its features. Indeed, without further scrutiny, one may be forgiven for glancing at the Keepsake’s spec sheet and crying out ‘bargain’ with gleeful ignorance. For one, it has a built-in amplifier and speakers, so all you really need for this all-in-one deck is a record and mains socket. Of course, as is more customary, a pair of line level outputs allow it to also sit within a hi-fi system or be hooked up to powered speakers. A 3.5mm input allows a portable source to play through the Crosley’s speakers, and there’s a headphone jack for private listening and tone controls to mess about with too. It can play at three speeds (33.3, 45 and 78rpm), caters for 7, 10 and 12inch records, and has the ability to record vinyl to MP3 files. On the latter, all that’s required is to download the Audacity software from the supplied disc. Newcomers to vinyl may be pleased to know the Crosley is to plug ‘n’ play what McDonalds is to food – it’s quick and easy. Everything comes pre-fitted, including the tonearm, cartridge and platter, and there’s nothing to the set-up process, bar putting the deck in place. Simply fasten down the transit screw, remove the tonearm clasp and cartridge cover, and you’re away. When a record finishes, the tonearm will even return itself to its resting place so you don’t have to worry about leaving the room to make a cup of tea. There’s no tonearm adjustment to worry about, although that has its problems; while most turntable tracking weights are around 2-3g, the Crosley measures in at over 9g. That means its stylus is putting three to four times as much pressure on records than is typical. 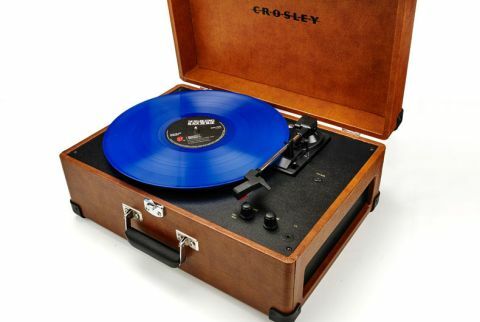 As with the Crosley Cruiser, we wouldn’t leave your most cherished albums in its hands for too long. Our impression of the Keepsake nosedives from there. The side-firing integrated speakers go loud enough to be heard across a decent-sized room and manage to avoid sounding tinny, but ultimately the presentation is woolly. It lacks clarity and detail, and every element of the sound seems squeezed within a confined midrange. Listening through a dedicated amp and speakers (turn the Crosley’s on-board volume dial right down) isn’t much more inspiring. Though it’s much clearer – the presentation doesn’t sound murky and surface noise is thankfully kept low – and happy to chug along tunefully to whatever we cautiously place on its platter, the Keepsake feels thin and restrained compared to the cheaper Audio Technica AT-LP60-USB and Lenco LP-85. Neither detailed nor engaging, it struggles to make even David Bowie’s genius The Rise and Fall of Ziggy Stardust and the Spiders from Mars album sound anything more than background murmur. His vibrato vocal sounds clear and unmistakeable if not particularly expressive, but due to the Crosley’s lack of insight and dynamics, instruments around it sound lacklustre and cluttered. That shouldn’t put you off ripping albums though, as files are no less clear or balanced than a Spotify stream. We’d simply be wary of when you hit that record button as, like with lot of USB turntables we’ve heard, silent periods before or after a track are often contaminated by faint hum. Aside from its loose lid and cheap-looking plastic dials, however, we have no qualms with the deck’s general construction. The Keepsake is smart, well built for the money and practically portable. Unfortunately for Crosley, no amount of attractive (and well applied) leatherette vinyl wrapping can overturn its fate – not even the most interesting finishes of the six available: ‘kilim pattern’ and ‘flower mandala’, in our opinion. It’s almost like the deck’s name carries a hidden message: keep this Crosley out of your shopping trolley for the sake of your albums. In other words, look elsewhere.